I just wanted to say a belated thanks to the team at For Sale By Owner and to recommend their service to anyone looking to sell their property privately. 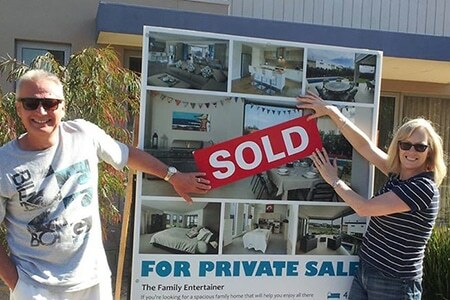 It often takes much longer to sell a house in rural areas than it would in a metropolitan suburb (some homes take more than a year to sell in our Vic Surf Coast town), but it took only two months to sell our house. Our sale price was much more than the top likely prices estimated by a number of experienced local real estate agents, and we saved over $20,000 in commission and advertising costs by selling privately. For Sale By Owner’s system was relatively easy to use and the support team members were always happy to help if we had any queries. There’s definitely still a place for great real estate agents, but if you are considering selling privately, I highly recommend you talk with the team at For Sale By Owner.